PXI Semiconductor Test System - TS 900 | Marvin Test Solutions, Inc. 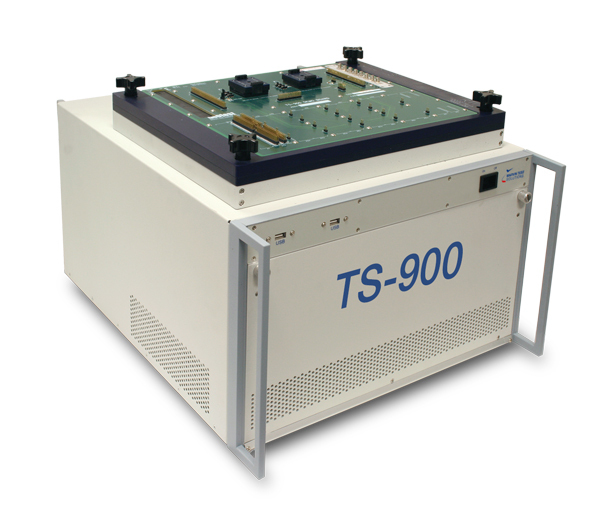 The TS-900 PXI Semiconductor Test System is an integrated test platform that offers comparable system features and capabilities found in proprietary ATE systems. Available as a bench top, with an integrated cart, or with an integrated manipulator, the TS-900 takes full advantage of the PXI architecture to achieve a cost-effective and full-featured test solution for device, SoC and SiP test applications. The test system incorporates a custom-designed, performance test interface that supports the use of PCB DUT (Device Under Test) boards - a proven and high-performance method for interfacing to the device under test. Additionally, the receiver interface’s pin blocks are field configurable, allowing users to upgrade the receiver when they modify or upgrade the system for new applications. The configuration of the receiver can support up to 512 dynamic digital channels, as well as a range of analog, power supply and RF resources. The basic system includes 64, digital I/O channels; 64 static digital I/O channels; a programmable user power supply; a system self-test and fixture; DIOEasy software for digital waveform editing / display, ICEasy - device test development tools, and Marvin Test Solutions' ATEasy software which provides an integrated and complete test executive and test development environment, allowing users to quickly develop and easily maintain test applications. With an additional 14 PXI slots available for adding more digital or analog test resources as needed, the TS-900 is the ideal test solution for semiconductor OEMs, fabless semiconductor vendors, incoming inspection / counterfeit detection labs and packaging / test vendors needing a low cost, configurable test system. For production test applications requiring integration with an automated handler, the TS-900 is available with the Reid - Ashman OM1069 manipulator which provides precise positioning of the test head and the flexibility to interface to automated probers and device handlers. The manipulator’s spring loaded design allows for easy alignment and docking to handlers - eliminating the need for a complex receiver interface. The TS-900M features a handler compatible slide receiver, which offers the flexibility to interface to virtually any device handler. In addition, fixture compatibility is maintained with the TS-900’s bench top receiver configuration, allowing users to interchange load boards between the screw down and slide receiver configurations. The TS-900 can be configured with up to 512 dynamic digital channels. The base TS-900 platform uses the GX5295 - a 3U PXI, 32 channel, 100 MHz digital I/O card with per channel PMUs. A wide range of digital and analog instrument options can easily be incorporated into the TS-900, offering users a compact test system that can support both functional and DC parametric test capabilities. And with the incorporation of an integral, modular test interface, the TS-900 offers users an application ready test system which can be upgraded or reconfigured in the field if needed. The system is also supplied with various software development and digital vector conversion tools, including support for ASCII, WGL, STIL, VCD and ATP vector formats. The TS-900 platform employs a modular, pogo-pin style receiver interface which consists of various pin blocks and is field re-configurable. Interfacing to the device under test (DUT) is done via a device specific PCB which mates to the pogo pin interface and is held in position with an integral stiffener / hold-down assembly. The hold down assembly employs a screw down mechanism for bench top configurations or a slide receiver mechanism for interfacing to handlers. Both mechanisms employ the same stiffener assembly, allowing users to interchange PCB load boards between the two types of mechanisms. For digital interfacing, the receiver employs dual, 68-pin block assemblies which connect directly to the TS-900’s PXI digital instrument resources, providing a high performance, controlled impedance interface. For user power connections, a power block is available which supports up to (4) user power suppliers and for general purpose analog and switching applications, a 78 pin block assembly with mating D-sub connector is available. RF and coaxial connections can be accommodated via an 8 connector, SMA block or blind-mate RF connector blocks. All receiver block positions are interchangeable, offering a high degree of flexibility. The TS-900 is supplied with a system self test which includes an interactive self-test software procedure as well as a self-test PCB which interfaces to the receiver. The self-test is an ATEasy based test program and verifies functional integrity of the system and resource connections to the test system interface. The TS-900 is supplied with ATEasy, Marvin Test Solutions' test development and test executive software suite; DIOEasy - a comprehensive digital test tool set for developing, debugging and importing digital test vectors; ICEasy - a library of device test development tools; and all necessary instrument drivers which are compatible with variety of application development environments including ATEasy, LabWindows, LabVIEW, Microsoft Visual Studio languages and more. These preconfigured tests, when combined ICEasy's Device Pin and Pin group mapping capability provides the user with a simple and streamlined method to assign tests to specific device pins as well as specifying pass / fail limits for each test, without having to do low-level instrument setup and control. The result is faster test creation and faster time to test. ICEasy's Current - Voltage (I-V) curve tool offers users the ability to graphically plot the I-V characteristics of a device's ESD diodes. This test method can provide insight into device failure mechanisms that can affect a device's I/O pins, such as electrical overstress (EOS), electrostatic discharge (ESD), bond wire problems, and packaging problems. And more recently, the use of I-V curve plots as an "impedance signature" may be useful in identifying counterfeit devices where the impedance or I-V signature of a known genuine part is compared to a suspect part. ICEasy's I-V curve tools allows users to easily setup voltage & current ranges and step increments as well as defining by name, the specific pin (or pins) to be tested. 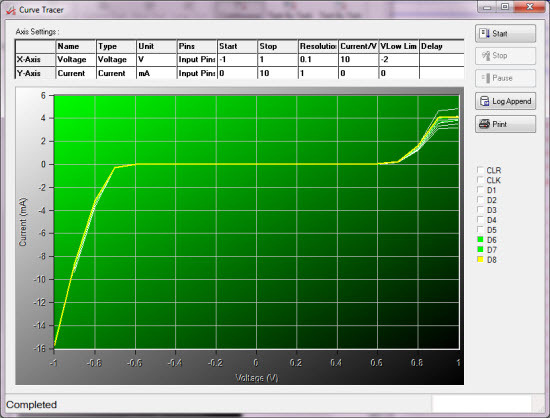 Additionally, all I/O pins can be plotted on the same graph, providing an easy way to compare all device I-V curves. (see figure below) The plotted data can also be easily exported via the TS-900's test executive (ATEasy). The ability to easily measure I-V characteristics and plot the results is a key feature for failure analysis and design verification applications. ICEasy's Shmoo plot tool allows users to easily vary test parameters on both the X and Y axis without programming - allowing test engineers to visually observe the pass / fail operating ranges of the device under test. An accepted test methodology for device characterization and qualification, the addition of the Shmoo plot feature to the TS-900 platform provides users with a powerful technique for design verification and early production test qualification. Supporting both automated and interactive control, ICEasy's Shmoo tool allows users to change parameters on the fly or to control the test via the TS-900's test manager (ATEasy) as well as logging the resulting data. 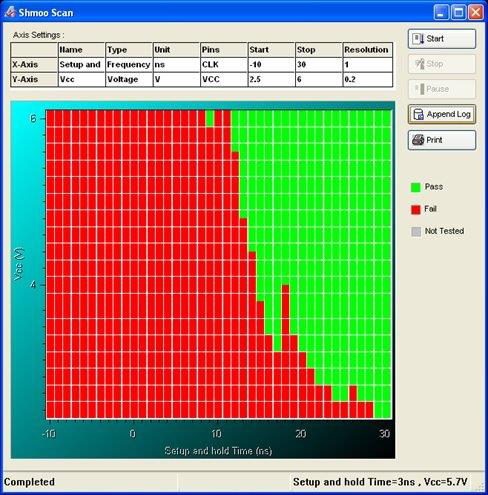 The IV Curve Tracer tool can sweep on Voltage or Current and plot the results. You can also append the plot to the test log or export the result to a CSV/Excel file. Multiple pins (a group) can be also plotted on the same chart. The tool can be also called in an automated mode, displaying the results directly to the test log. The Shmoo tool allows you to configure and display Shmoo plots. The plot can be appended to a the test log, printed or you can also export the results to a CSV/Excel file. 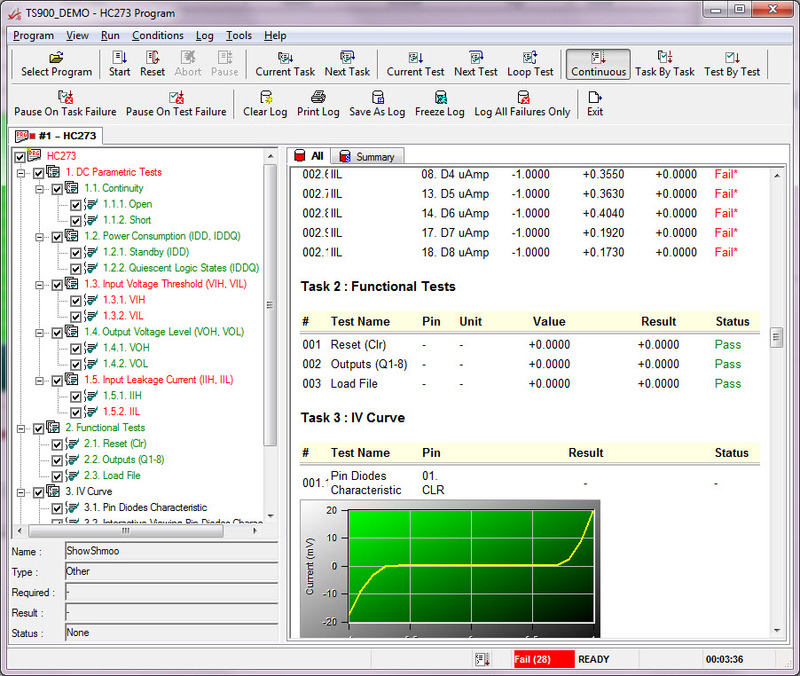 The tool can be also called in an automated mode, displaying the results directly to the test log. PXI 10 MHz Integrated 10 MHz PXI clock with an auto-detect function. Presence of an external 10 MHz clock (from external input of timing slot) will disable the internal clock. 10 MHz Output 10 MHz output is available via a rear panel BNC connector, TTL compatible level. Digital Test System configured with 64 Dynamic 100 MHz Digital I/O channels with per pin PMU, 64 Static Digital channels, 0-20 V, 2 A user supply, and a receiver interface. Systems also includes system self test, ATEasy software license, monitor, keyboard, mouse, and DIOEasy. TS-900 Test System Configured with 64 Dynamic 100 MHz Digital I/O Channels with per pin PMU, 64 Static Digital Channels, 0-20 V, 2 A User Supply, and a Receiver Interface. Systems also Include System Self Test, ATEasy Software License, Monitor, Keyboard, and Mouse with Manipulator and Slide Receiver. Digital Test System, Slave configuration, Configured with 64 Dynamic 100 MHz Digital I/O Channels with per pin PMU, 64 Static Digital Channels, 0-20 V, 2 A User Supply, and a Receiver Interface. Systems also Includes System Self Test, ATEasy Software License, and Slide Receiver. TS-900 Test System Configured with 64 Dynamic 100 MHz Digital I/O Channels with per pin PMU, 64 Static Digital Channels, 0-20 V, 2 A User Supply, and a Receiver Interface. System also Includes System Self Test, ATEasy Software License, Monitor, Keyboard, and Mouse with Slide Receiver, manipulator ready.